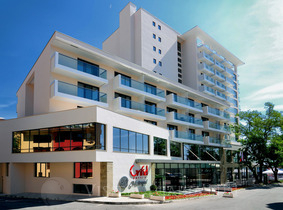 Grifid Metropol Hotel in Golden Sands, on the Black sea in Bulgaria. Book luxurious holiday on the beach online! Location: Grifid Metropol Hotel is located in the central part of the Golden Sands resort, next to the beach (10 m), 500 m from the centre of the resort, 50 m from the shopping centre and 500 m from a bus stop. Accommodation: Grifid Metropol Hotel offers 129 modern rooms with comfortable balconies facing the sea and the park. All hotel rooms are modern and elegant, featuring bathroom with bathtub, (additional shower in the junior suites and in the apartments),hair dryer, wall-to-wall carpet floor, direct dial telephone, central air-conditioning, satellite TV, complimentary mini bar service (mineral water, soft drinks and beer, refilled every day), safety deposit box (at extra charge), Wi-Fi access in the rooms (at extra charge), balcony. Spa & wellness: The modern Wellness Center offers different kind of Massages, Sauna, fitness and Relax Zone. Beauty Centre is also available, offering hairdresser, manicure and pedicure. All services in the Wellness Centre are upon additional charge. Sports & leisure: Grifid Hotel Metropol offers Concierge service from 9 a.m. until 6 p.m. Guests can play tennis free of charge at the Grifid Hotel Metropol, which is just a few steps away. In front of the hotel, near the beach is an outdoor pool complex with facilities for children, including a water slide. Guests can dine at 3 excellent restaurants – Main Restaurant, Italian and Fusion A la Carte. All meals except breakfast are served A la Carte. 2 bars – Pool Bar and Piano Bar serve imported and local alcohol, local draft beer and wine, soft drinks, cocktails from 10:00 until 24:00.